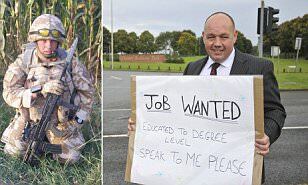 The story you're about to read is a true life story of an army veteran who was pictured at a roundabout holding a placard with an inscription "Job Wanted" and miraculously got job offers from 70 different firms. Job wanted. Educated to degree level. Speak to me please'. And now he says he feels 'positive' about getting work as a result, with 70 parties showing an interest in him. Among the messages was one from a former Army officer now working at Barclays Bank, inviting him for an interview to see if there's a role that would suit him.